We have been trying to perfect this filet-slathered-with-paté-inside-of-puff-pastry dish for 10 years or so. We are getting close. BTW, do you know what they say about jokes involving meat? It's a rare medium well done (Henz). One of our challenges has been to find not just a decent paté - but any paté. (You are going to coat the meat in it before wrapping in pastry.) I gather Americans don't eat that much paté. 1. Cut the meat up into pieces of equal size. We prefer to use small, single-sized portions rather than a massive loaf. Trim the meat of excess fat and tendons and make neat. 2. 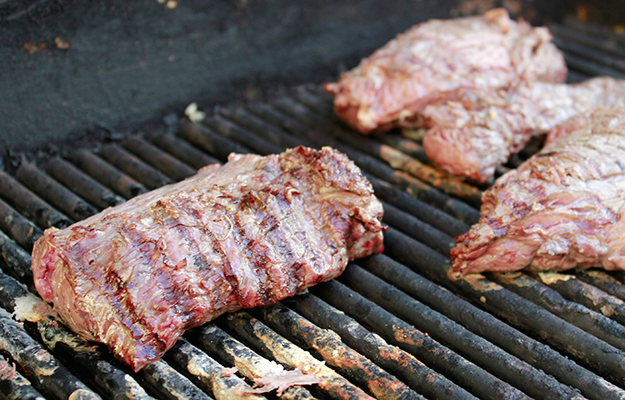 Salt the meat heavily after the trim, then prepare the meat for browning (get your barbecue ready). 3. Lay the meat out on your barbecue (or other quick-browning apparatus, like a very hot pan or griddle) and cook until seared on the outside. Don't cook through. 4. While the meat cools, put the pate into a bowl and add diced onion and marjoram. 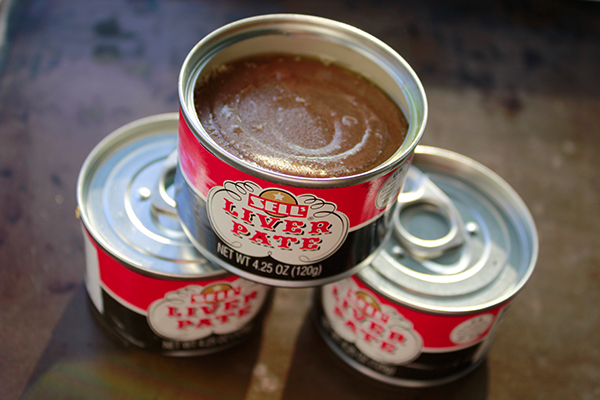 Mix until paté has a spreadable consistency. 5. 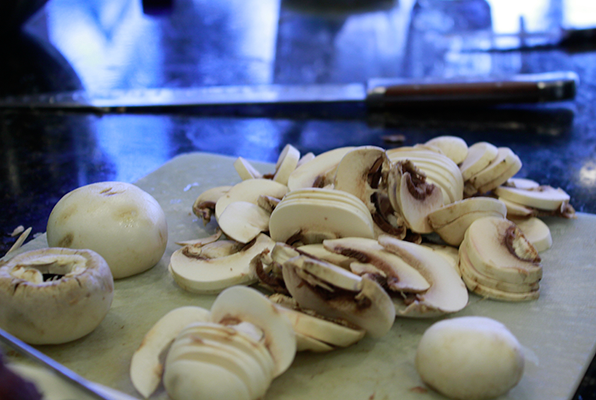 Cut mushrooms into thin slices. 6. Pre-heat oven to 425 F.
7. Once meat is cooled, unroll the puff pastry onto some parchment paper and cut in half. Coat three sides of the meat in paté mixture, then top with mushrooms. 8. Fold the puff pastry around the meat leaving little or no air and seal gently with a fork. Then brush with a mixture of egg and water. 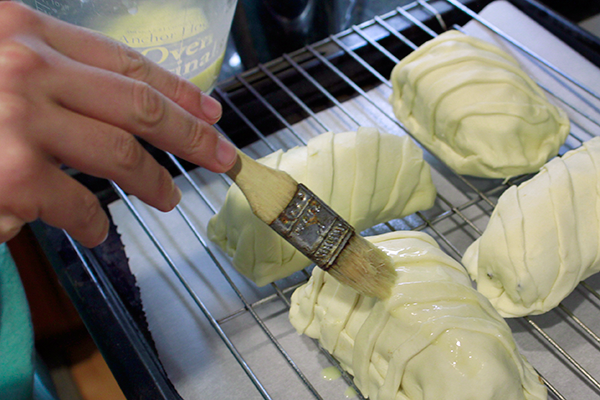 (Before this step you may slice off some puff pastry to decoratively lay on the top of the meat parcels). 9. Repeat step 6 for each piece of meat. Then place in the oven at 425 degrees Fahrenheit for 5 minutes. After that time lower the temperature to 350 degrees and continue cooking for 15 minutes. 10. Take out of the oven and serve. Garnish with a nice side of potato casserole and carrots, and maybe a mushroom sauce. Maybe prepare a quick mushroom sauce with the leftover 'shrooms (butter, brandy, salt, pepper). We like to serve thusly, with a potato casserole. You will need nice sharp knives to do justice to the beef wellingtons.